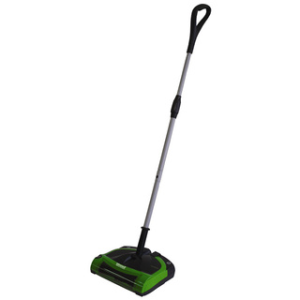 Bissell BigGreen Commercial Cord-Free Electric Sweeper is a Rechargeable System with Revolving Agitator Brush and Geared Belt Drive for Superior Quick Pickup Cleaning on all Surfaces. For those times when a vacuum is too inconvenient and a broom is too time consuming, reach for the Bissell BigGreen Commercial Cordless Electric Sweeper! 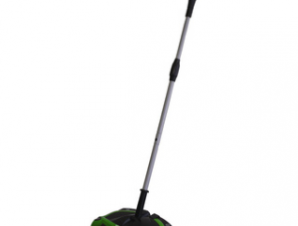 The Cordless Electric Sweeper is surprisingly lightweight and powerful for its size. It employs a Nickel-Metal-Hydride battery with a running time 90 minutes. The battery-powered roller brush sweeps dirt and bulkier items into its dustpan, which is easily removed for emptying. The Cordless Electric Sweeper comes with a wall mount for out of sight storage and includes a compact power adapter for charging. Whether sweeping up crumbs from under a table, tidying up after children or quickly cleaning before and during a party, the Cordless Electric Sweeper will help you spend less time cleaning and more time doing the things you enjoy!.